I've made an Aurabot guide and a Cursebot guide (working on the mana guardian one too), and thought I could make this the Support guide page for all of you guys who enjoy playing supports ! Aurabots don't work for free !!! Do NOT join "my loot your exp" parties, if you do, remove your damage auras and any other auras you don't need for your own survivability. If it helps, I run either FFA where I loot and put in a dump tab to share 50-50 later (for large groups with leechers), or PA with a two-man group with split of exalts and above. Furthermore, I unfriend any carries who even put groups with "LF Aurabot, my loot". I've played a bunch of characters over the past 3 leagues, but always ended up going back to playing aurabot gameplay, because, let's face it, I'm a lazy b***. I'm sure most aura players have realized the potential of a Victario's, but kept dying to chaos damage, due to negligence of their corruscating elixirs, and simply gave up to play with a shavronne's. I've added 3 different builds, the first being the one I currently use, which is to maximise DPS boost, by using a 2-handed weapon for the +% damage from auras to allies - if you invest into this build, there will be no other aura who can top your DPS buff. The second build is a little safer, and uses a one-handed weapon and shield, but does an insane boost as well. This build is designed around Delve, and isn't taking into account Incursion double corruptions or Legacy gear from Standard, but I have placed below, some of my standard legacy/double corrupted gear as well. If you have any questions, you know what to do. I may add, this build is not budget friendly, but there are ways to run this build cheap initially, and fit more expensive items in as you go along. Leveling is always a pain as an aurabot, if this is your first character, I suggest you join a public party and start off with a frost blades or arc setup, as you won't be a full support until you hit level 68+. 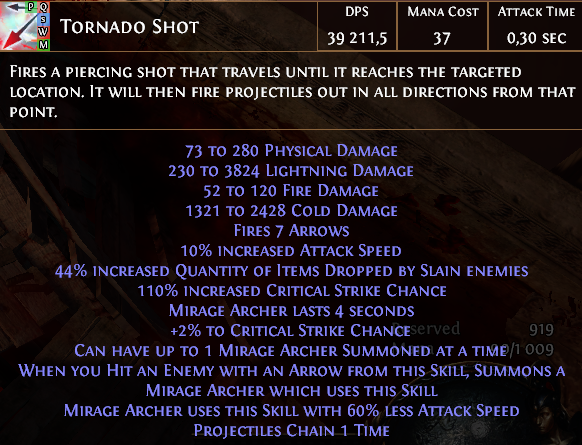 As per MaousAura's suggestion, caustic arrow mirage archer (for clearing) and toxic rain for help boss killing can help early. For a cheap start, I would look for a 6 socket Victario's Influence with 15% increased effect of non-curse auras from your skills. I would then recolour for 2 red, 1 green, 1 blue in the first 4 sockets, and get a 4 link on those. You will place Wrath, Anger, Hatred and Empower in these. Ideally you will want Vitality and Haste in the last 2 remaining sockets, which do not need to be in a 6l. Alpha's Howl and Shaper's touch uncorrupted with good rolls should be cheap to acquire. For the belt, you can either get a Stygian vise with Energy Shield & Strength, which will grant you an additional abyssal jewel socket for a jewel with 1% reduced mana reserved implicit, or a Bated Breath with good rolls should also be cheap. For boots, you ideally want Skyforths, but these can be pricey for newer players, so you could settle with Sin Trek's and drop an aura/curse until you can acquire Skyforths. For an amulet, you should be able to acquire an amulet with 5% reduced mana reserved at a decent price, and forego the flat Energy Shield & % Energy shield rolls until you can acquire a better one. Rings should be very cheap, look for Energy shield & Strength with good rolls, and if money permits, look for Anger, Wrath, Hatred has increased effect as an implicit, or simply more Energy shield if you feel too squishy. As a starter weapon, you can either use a Corona Solaris, which grants a blind to nearby enemies (basically a free curse), or a sword with "socketed movement skills have no mana cost" so that you can easily run "no regen" map mods. The third option is to use a sword with "Auras from your skills grant 2% increased damage to you and allies". For the shield, look for a cheap shield with "Socketed gems have 15% reduced mana reservation", ideally you want the highest Energy shield value possible here, but whatever your budget permits. You could also use this belt, for the highest achievable DPS boost, but I feel it would lower our ES too much. This build gives me 10,086 ES. A +2 AOE or +2 AURA gems corruption is preferred, as it won't require you to have a full 6 link to start things off. 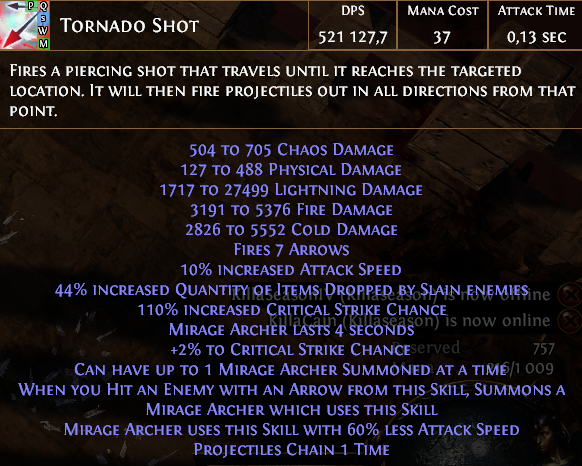 Shaper weapon crafted with fossils, will enable you to run a "14th aura" and not have to worry about movement skills mana costs, effectively disregarding "no regen" map mods. For a start build you could consider having either buff "socketed movement skills have no mana cost" or "auras from your skills grant 2% increased damage to you and allies". An amulet with 5% mana reserved is absolutely necessary, ideally you also want flat ES and %ES on it. Dexterity would also be helpful as the build is DEX starved. If you are rolling in cash, you could also look for a +1 curse, Discipline, Anger, Hatred, Wrath has increased effect implicit. Alpha Howl is a must, as it reduces global mana reservation. If you do not have corrupted Shaper's Touch gloves with +2, you will want to run your Purities in your helm to hit the max res cap. An ES shield with "socketed gems have 15% reduced mana reservation" is best in slot, as it will save us having to get more jewel sockets in tree. Shaper's Touch are best in slot as they give a massive boost to ES. +2 AOE or AURA gems enables us to run our lvl 21 purities in there to give max res cap. Skyforth's are a must as well to help with mana reservation, as the build doesn't run Blood Magic. You could start with any rare ring with flat ES, for more min maxing, you want to look for rings with STR (which converts to ES with shaper's touch) and INT (Clarity Watcher's Eye) as well as a corruption to Discipline, Anger, Hatred, Wrath has increased effect. High rare ES belt or Bated Breath with corruption Discipline, Anger, Wrath, Hatred has increased effect can also be used. Note that fossils now enable interesting crafts with "increased energy shield from body armour", but is not a must. To effectively run 13 auras & 2 curses you will need 10 jewels with 1% mana reserved implicits. If you are running this build on a budget, you may need to begin with simple jewels with just stats such as Strength, which boost ES thanks to Shaper's Touch gloves. The Watcher's Eye with clarity will greatly enhance your ES, if you invest into INT or MANA, but will still give you a significant buff regardless. I prefer to run Phase run, have never liked the Shield Charge mechanic, but you can switch to Shield Charge + Faster Attacks Support if that's your jam. With Legacy gear we can look for double corruptions thanks to incursion, the most important one being the chest, but if you can get jewels, rings or amulets with double corruptions that would be even better. I would suggest running Corona Solaris instead of United in dream, as it enables us to run effectively 3 curses, which most parties will prefer to a 14th aura. However, once delve merges with standard, we will be using the "auras from your skills grant 2% damage to you and allies" sword instead. Running Aegus aurora means we have less Energy shield, and need more jewel sockets from skill tree with 1% mana reserved implicit jewels, but will make us much tankier. With a 75% physical damage block rate (45% spell due to nerf), we effectively refill our ES pool with 2 blocks, thanks to a legacy Rumi's concoction. You could swap 4 ES nodes to go after "Essence Surge", which would grant an additional 15% faster start of ES recharge, but due to my watcher's eye, granting me 40% already, I deemed it unnecessary. If you wanted to min max even more, you would have a +2 AOE or AURA gems corruption on your skyforths and put your purities in there. You would then put your curse setup in the gloves with +2 to level of socketed curse gems, and put your Animate Guardian and Discipline setup in helm. 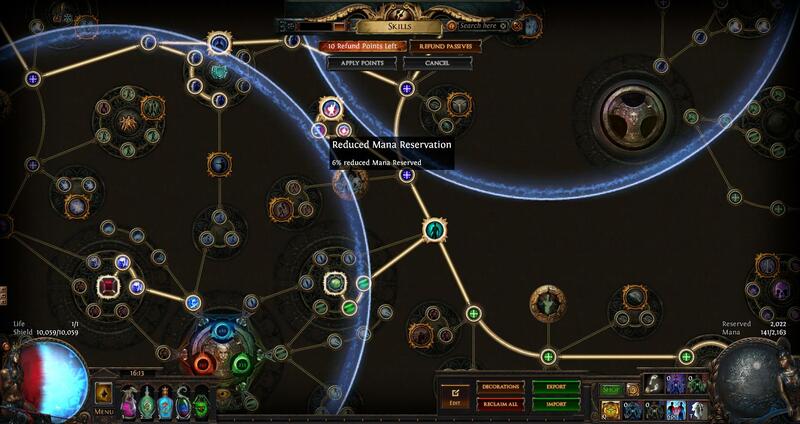 If you invested into more mana reservation in your skill tree, via additional jewel sockets, you could place Vaal Grace & Determination in the helm, but this would leave you with a much lower ES value, and I don't think it's worth the risk. Hey Yuna, good to see you, it's me "BottingForResists" in Standard. I would actually swap out your curses for 20-23's as they are stronger with quality than level ! Yeah, I'm going to update the guide with a standard/legacy variant. All I have to say : BEST Aura build in TOWN !! 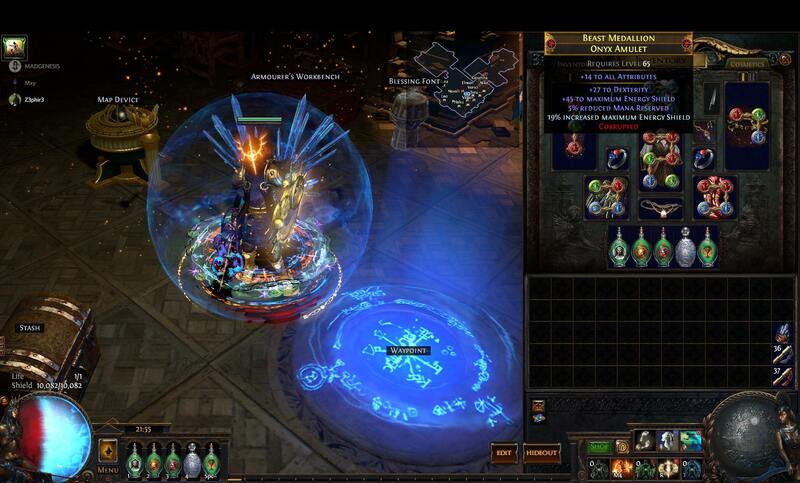 - i'll find better dual corrup curse like 21/23 when 3.5 comming . need tone of them for min/max our build . As you said, there will be no Aegis on that build, but it can be a high ES build, which will be less tanky in sustaining ES.